Once overshadowed in the U.S., this tasty medicinal berry is making a comeback. Find out more about its diverse applications. Widely cultivated in both home gardens and commercial plots, blackcurrants strongly resemble blueberries at a glance. Small, round, and almost black in color, blackcurrants came into demand during World War II when fruits rich in vitamin C were difficult to obtain in the U.K. and the berry proved a worthy alternative. However, due to its threat to the U.S. logging industry, currants were banned in the United States from the early 1900s until recently, when the federal ban was shifted to the jurisdiction of individual states. Blackcurrants are currently a popular ingredient in jellies, jams, syrups, and many different types of desserts, as well as in the production of alcoholic beverages. The berry is used in traditional medicine in Austria and other parts of Europe to treat coughs, infections, and gastrointestinal disorders. Boosting brain functions. Blackcurrant consumption has been associated with improved brain functions, including motor skills and memory. Preventing cardiovascular diseases. Blackcurrant promotes blood flaw, which helps prevent the build up of plaque in the arteries and reduce blood pressure, thus reducing the risk of cardiovascular events, such as stroke and heart attack. Lowering inflammation. The powerful antioxidant action of these berries has been shown effective for the relief of inflammatory diseases, such arthritis. Treating hormonal imbalances. 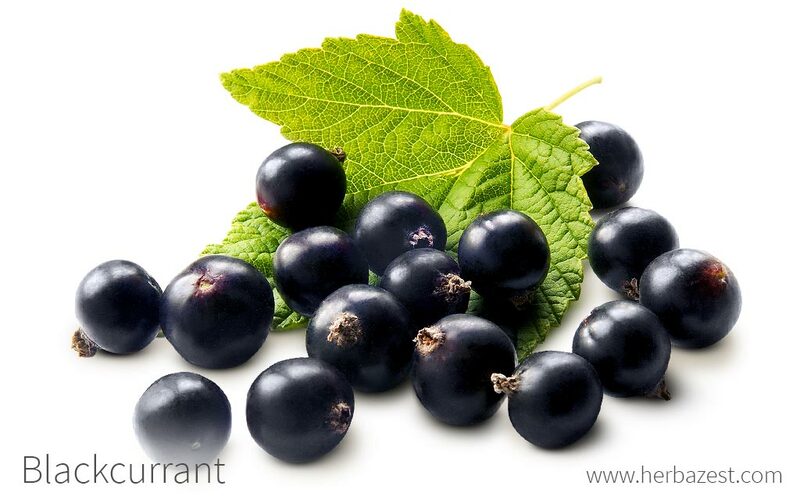 Blackcurrant has proven to be useful in treating menopause symptoms and relieving Premenstrual Syndrome (PMS). Blackcurrant berries are rich in phenolic acids - mainly anthocyanins - that can protect the body from inflammation of heart disease, infections, and neurological disorders. The blackcurrant 's seed oil contains gamma-linolenic acid, a type of omega 6-fatty acid that helps stimulate essential growth in the body, maintain bone health, and promote cardiovascular health. On the other hand, tocopherols and phytosterols also play an important role in the anti-inflammatory and cardiopropective actions of blackcurrant. Like in most berry fruits, the neuroprotective and nootropic effects of blackcurrant are related to the combined action of powerful phytochemicals, such as anthocyanin, caffeic acid, catechin, quercetin, kaempferol and tannins. Moreover, studies suggest that blackcurrant anthocyanins can act as phytoestrogens, helping relieve premenstrual syndrome (PMS) and regulating hormonal imbalances during menopause. Not only are anthocyanins antioxidant and anti-inflammatory, but they are also the compounds responsible for the berries' deep hue. Brain boosting properties are also present in blackberry, ginkgo, and saffron, whereas aspen and ashwagandha provide similar anti-inflammatory benefits. Blackcurrant is likely safe when consumed as a food, or when either the berry or seed oil is used as medicine. The berry might slow blood clotting and can lower blood pressure, although very large dosages are needed for this. Pregnant and breastfeeding women should avoid consuming blackcurrant in medicinal amounts, since there is limited research on the effects it could have. Blackcurrants not only boast medicinal benefits, but they also have an impressive nutritional profile. These wild berries are rich in vitamins B5 (pantothenic acid), C (ascorbic acid), and E, as well as dietary fiber, iron, and manganese. Like most berries, blackcurrant can be consumed in both herbal remedies and culinary preparations. Raw. Eating the berries raw is the best way to reap their fiber content and antioxidant benefits. Blackcurrant berries can be used as a dessert fruit thanks to their tart and fruity flavor. Cooked. Like other berries, blackcurrants can be turned into syrups, jams, jellies, cakes - any kind of dessert one could imagine. Powder. Blackcurrant powder can be mixed into juices and smoothies to add a nutritional boost. Oil. Blackcurrant seed oil can also be taken aside from in capsules. It contains gamma-linolenic acid, an omega-6 fatty acid, and may be used as a carrier oil or consumed on its own. Capsules. Blackcurrant supplements provide the medicinal benefits of the herb in a compact package with a consistent dosage. The capsules or softgel tablets are typically filled with blackcurrant oil, which is rich in omega fatty acids. Fresh blackcurrant is not easy to come by but it can be found in some organic markets and farmers markets. This is due to the fact that several states in the U.S. still ban blackcurrant production in order to protect local trees. However, blackcurrant seeds can be purchased online, to be grown in home gardens, as well as blackcurrant powder, which has a long shelf life and can be added to a number of preparations. Blackcurrant oil and supplements are readily available through online retailers, as well as many other blackcurrant products, such as jam and jellies. While blackcurrant is considered relatively easy to grow, it requires a specific environment to thrive. In order to succeed in its cultivation some basic guidelines need to be followed. It is important to purchase certified stock before growing one's own blackcurrant bush. This plant tolerates a wide range of soils, but it prefers well-drained, loamy soils and plenty of sunlight. Depending on its native region, frequent watering may be needed during the dry season, as well as fertilization with strong, thoroughly-rotten manure. Since their roots need room to expand, for large scale blackcurrant cultivation, ideal spacing between rows should be six feet (1.8 m), and each plant within the same row should be kept at least five feet (1.5 m) apart. The crop is known for suffering from harmful diseases and pests, most notably white pine blister rust. Blackcurrant is a shrub that can reach six feet (1.8 m) tall and is native throughout northern Europe, as well as central and northern Asia, but also grows widely across North America. Its woody, spineless branches hold aromatic leaves that grow in alternating pairs or clusters. Small black berries grow in bunches during the summertime. Blackcurrant (Ribes nigrum) was formerly part of the Grossulariaceae family, which comprised over 350 species across 25 genera. However, some botanists have divided this large group into eight families, classifying the Ribes genus as a member of the Saxifragaceae (currant or gooseberry) family, which - up to date - it is thought to include a total of 33 genera. Gooseberries are also members of the Ribes genus and only differ from currants in the appearance of their flowers. The jostaberry is an interspecies cross between gooseberries and blackcurrants, with fruits that are black but larger than currants. The Ribes genus contains an average of 150 species, common in the temperate regions of Northern Europe, Asia, North America, and mountainous areas of South America and northwest Africa. The most economically important species related to blackcurrant are American blackcurrant (Ribes americanum), redcurrant (Ribes rubrum) - which includes different white cultivars -, whitecurrant (R. petraeum), and pinkcurrant (R. vulgare) - from which also white and red cultivars have been developed. Blackcurrant has the following varieties: R. nigrum var. europaenum, R. nigrum var. nigrum, and R. nigrum var. sibiricum. In the U.S., three blackcurrant cultivars, 'Ben Tirran', 'Ben Connan', and 'Ben Alder' have been patented by the USPPs (U.S. States Patent and Trademark Office), while 'Titania' has propagation rights protected by contractual arrangements between breeders and growers. Other popular blackcurrant cultivars are 'Ben Sarek', 'Consort', 'Coronet and Crusader', and 'Ben Lomont'. Currants' first record of cultivation and human consumption can be traced back to the Renaissance in Europe (14th and 17th centuries), when they started being grown in farms and gardens. Old herbalist texts from the 1600's describe the medicinal properties of currants. When early settlers introduced European currant into North America, in the late 1700's, they realized that native Americans have been harvesting a local variety of currant from the wild for centuries, to use the berries in medicines and dyes. The Prince Nurseries on Long Island became the first one to offer currants for sale in 1770. During the 1800's and early 1900's, black and red currants were widely grown in the U.S. and Canada. However, in the late 1890's the fungus that causes White Pine Blister Rust (Cronatium ribicola) was imported on infected pine seedlings, changing the fate of currants in North America. By 1911, the disease had been reported in most of the Northeast, including Massachusetts. As many as 11,000 men were employed in a single year for currants' eradication in the national forests due to the fungus infestation. In the 1920's, the federal government issued a plant quarantine against the importation and cultivation of currants. The federal ban continued until 1966, when it was finally rescinded, leaving it up to individual states whether or not to maintain restrictions. Massachusetts has retained, to this day, the 1920's prohibition statewide, allowing red or white currants alone, as well as gooseberries, only in certain towns. Although the federal prohibition was lifted in 1966, blackcurrants are still banned in many states in the U.S., and are a minor crop in others. For this reason the dark berries still not widely traded and remain quite expensive in local markets. However, the popularity of blackcurrant is on the rise: Japan currently imports $3.6 million USD worth of New Zealand's blackcurrants to produce dietary supplements and other functional food products. They are also very popular in Eastern Europe, and Russia is the world's top producer. Blackcurrants are generally known for their alimentary uses, providing a slew of health benefits. However, non-edible products are created from the plant as well. Blackcurrant seed oil is used in many different cosmetic products in combination with vitamin E. Blackcurrant's leaves produce a yellow dye, while a blue or violet dye is extracted from the berries. ©Copyright 2018. HerbaZest. All Rights Reserved. DISCLAIMER: Information provided for educational purposes only. It has not been evaluated by the FDA. It's based on pharmacological records, scientific research, traditional knowledge, and historical data. HerbaZest.com is not responsible for the accuracy of the information.